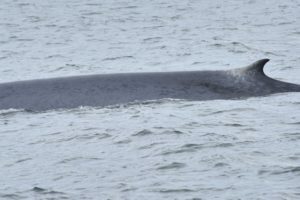 Whale Watching in North Iceland Hauganes – Welcome to Iceland’s Oldest! Last Thursday we had an amazing experience at Whale Watching Hauganes. On our way to see the amazing humpback whales we noticed even bigger whales. First of we weren’t sure what kind of whale it was but after taking some photos and analysing them we saw that it were blue whales, what amazed us even more was that it wasn’t a single one. They were two together and seemed really calm, only 2 miles north of Hauganes. 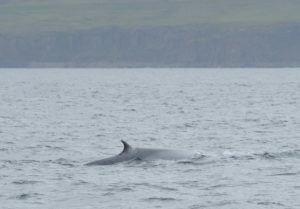 They headed south, deeper inside the fjord and in the 13:30 tour we one of them again only 2 miles south of Hauganes. It was a really exciting day and we were really happy to be able to show our passengers these majestic animals. 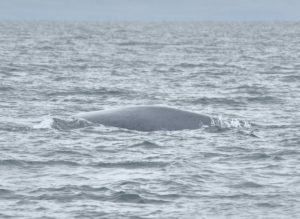 Today we have seen one of the blue whales again, we know that it’s the same because of a distinctive spot right in front of the dorsal fin. We have therefore named him Spot and we’re hoping that he’ll stay for some time. 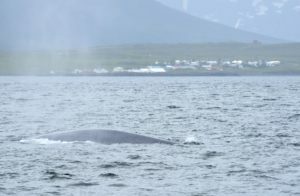 It’s really rare to see the same blue whale here in Eyjafjörður with some days in-between so maybe it’s a sign that he’ll stay for some time. We will keep on hoping that he’ll stay. On top this the weather has been great and the humpback whales have been moving a bit further north so we are super happy at Whale Watching Hauganes, the birdlife around our village is also great and the seagulls and fulmars are common guests at our tours. We have free spots today (21/6) at 18:00, don’t miss out! 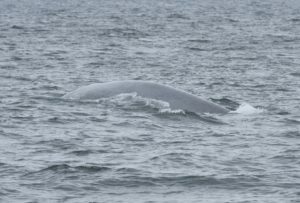 The chances of seeing a blue whale are pretty high! The 2019 season is just around the corner! The whales cometh! Our tours are from now on carbon neutral. if you've sailed with us lately, thank you!